Some women swoon when their loved one surprises them with roses. (I never swooned, but I was touched by the gesture once. 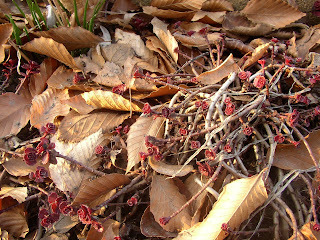 *) As far as I'm concerned, a boughten bouquet has nothing on emerging spring foliage in terms of excitement. Inspired by Colleen's picture of emerging bleeding hearts, I went around my garden and photographed a few of my current favorites to share. My hand is in each one to give you an idea of scale. The fronds of 'Brise d'Anjou' polemonium caeruleum (Jacob's ladder) seem to sprawl excitedly out of the ground at the first hint of warmth. 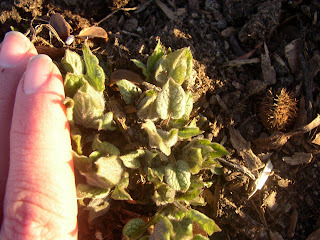 This is the plant that I worried over after it made a very early appearance around the turn of the year. I had wondered whether it would survive its first winter, with the warm start and the sudden temperature plunge that followed. 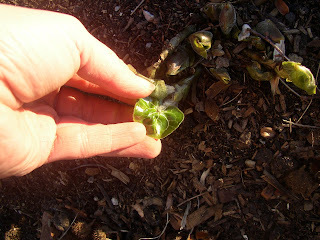 The second picture shows the felty hearts of 'Jack Frost' brunnera macrophylla, each leaf no bigger than my fingernail. This plant surprised me by making me fall in love with it--I generally do not appreciate white leaf variegation in my own garden. Maybe it was just silver enough, or maybe the eye-popping planting around it was its ticket to acceptance? Placed at the foot of a dark urn planted with carex buchanii and 'Vodka' begonias, it shared company with black mondo grass, yellow creeping jenny, 'Chocolate Chip' ajuga, scaly buckler fern, 'Othello' ligularia, 'Hillside Black Beauty' cimicifuga/actaea, and more of those cherry-flowered begonias. Can you guess what is sprouting in this last picture? It took me a minute to remember what these little rounds of leaves could be, but the glossiness gave them away. And then I remembered that I had trimmed several ratty leaves off of this European ginger last week. When I purchased a pint of this plant at a master gardener plant sale, it was mislabeled as the supposedly hardier Canadian ginger. I bought one pot of each, but the latter disappeared a month later and has not been seen since. I usually try to visit my parents in Northwest Ohio as April turns to May, because seeing the large-flowered trillium (trillium grandiflorum, below) and other spring wildflowers in bloom reminds me of my childhood. I won't be able to make my usual trip this spring, as I am working part-time at a local garden center to fund a few house projects... so I am indulging myself in a virtual trip here, courtesy of pictures I took in the spring of 2005. I cringe a little to realize that some endangered plants like trillium were always part of our "bouquets," but since the forest floor is covered with them now we must not have done too much damage after all. The trees in the woods are mostly tall and mature, but there are occasionally young, leggy understory shrubs and trees as well. Thanks to the anonymous emailer who helped me to identify the flowers on the understory beauty below as those of the common pawpaw (asiminia trilobia.) I have long wanted to try the supposedly custard-like fruits of this tree, so I wish I had known to go back and search for it later in the season! I appreciate that certain woodland plants look particularly garden-worthy, like the Jacob's ladder (polemonium reptans) below, surrounded by ferns and toad trillium (trillium sessile--lower left.) Carpets of common blue violets form drifts of groundcover as well. I feel very fortunate to have access to traditional spring garden flowers now, and would not be without tulips, crocus, brunnera, and the like. But to me the spring wildflowers of the Ohio woodland will always be the harbinger of the season... the flowers that finally mean I can go barefoot for a good long while, and summer is right around the corner. I am looking forward to seeing them again in person, next year. The County Clerk tagged me for a meme earlier in the week and I am just now getting around to responding. I am to list 5 Crazy Things--things so crazy, that only a gardening addict would admit to them. I might be overly tolerant, I might just be that comfortable in my own insanity, or I might be well over the line into delusional... but I really don't think that any of my gardening behavior is all that unreasonable. 1. Gardening at Night. This is not a new idea--in fact, REM wrote a song about it in 1982--but it still gets me strange looks from the neighbors. Sometimes I do it because I'm still playing in the yard long past sundown, sometimes I do it to enjoy the garden in relative peace and quiet, and sometimes I do it to escape the heat of the day. I admit that it's much easier to do in my new house, because there's more light pollution in the city and thus less chance that I will accidentally weed out a self-seeder that I would have rather kept. 4. Planning vacations around gardening season. Spring and fall trips, frankly, are out of the question. All I want to do is spend hours upon hours outside during those times of the year, rain or shine. When the garden is on autopilot during the heat of July? Sure, we can take a weekend away then! 5. Garden Voyeurism. I really fail to see the problem with arranging your morning and evening dog-walks around trash pickup schedules (see #3) or according to which houses/gardens you haven't checked out lately. How else are you going to know if the greyish blue house with the yellow climbing rose decided to set out huge clumps of late-flowering yellow tulips to play off of the first rose blooms again this year? So there you have it. I might have a few quirks when it comes to gardening, but I'm definitely not crazy! Although we can now eat it anytime thanks (or no thanks) to refrigerated cross-country shipping, asparagus still strikes me as being a taste of spring. I love to eat asparagus roasted in a bit of olive oil until it is just softened... maybe sprinkled with some freshly cracked black pepper or a bit of grated asiago cheese... or drizzled with a little fresh balsamic vinaigrette. Yesterday I stopped in at my favorite local garden center to get some generic potting soil. I noticed that amongst the bulbs and seeds they also have asparagus roots, and that got me thinking again about growing my own asparagus. I love the challenge of figuring out how to incorporate edibles and herbs into my small yard and garden while keeping everything aesthetically pleasing, and for the most part I think that I succeed in this fairly well. Asparagus is proving to be my downfall, though. Between the trenching and the need for lack of competition, it just seems to be more of a "farm" type of vegetable than one that can be worked into a landscaping situation. Remember when I mentioned winter sowing back on the winter solstice? Well, I wouldn't start my winter sowing quite that early, but I did start it in late February last year. This year, I feel like I'm way behind. The tulips that I planted in the fall are already shooting up in the front yard. 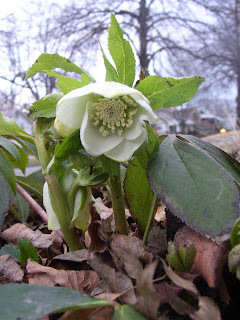 Hellebores are blooming, and sprouts of everything from Jacob's ladder to cardinalflower are showing. Some people, like Colleen, are already exulting in the appearance of their winter sown sprouts--and rightfully so! But until today I had no little "ghetto greenhouses" lined up along the side of my house. 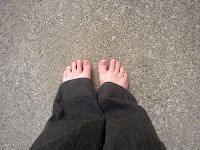 With the spring equinox right around the corner, and my fingers itching to get dirty, it was definitely time to rectify that situation. I am a little short on winter sowing containers right now, so I started with the perennials and hardier annuals. Somehow, most of the seed varieties I picked were teensy-tiny, like these. 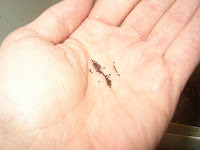 Luckily, the seed companies tend to really pack a lot of these small seeds into each packet so I didn't have too much trouble scattering them in the container. When you winter sow and get too many seedlings in a container, you can plant them out in chunks. The strong ones eventually crowd out the weaker ones as they fight for nutrients. 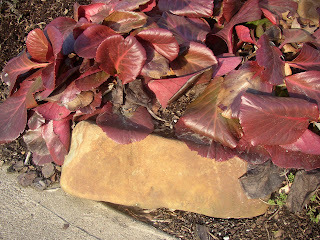 The coleus is an experiment because winter sowing it seems like a hit-or-miss thing. The rest of the seeds should do okay for me, I hope. In a few weeks, I will find out whether my winter sown seeds will sprout... taking the leap of faith to sow seeds on the spring equinox seems appropriate in light of the hopeful nature of the season. 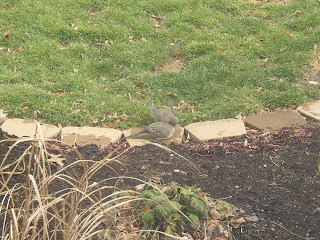 At first, I was sure that these two mourning doves were fighting... they were pecking each other about the face, and puffing up their feathers. However, it soon became apparent that I was thinking about 180 degrees in the wrong direction! Afterwards, the male sat around puffing out his feathers for a minute or two, and then began to groom the female around her neck. What a difference a month makes! 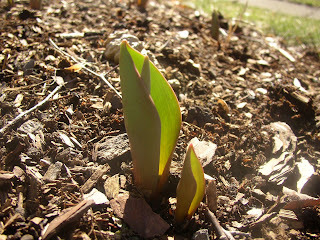 The snow is gone, the birds are singing, and I finally have something to contribute to Garden Bloggers' Bloom Day. I admit, the first picture has nothing to do with blooms OR buds, but I adore these little rosettes that appear on the ends of the fleshy stems of 'Voodoo' and 'Fuldaglut' sedums. They look like tiny flowers--and it's March, so we get to take some creative license with Bloom Day here in Zone 6, right? It's raining so heavily here that I couldn't get good new pictures. 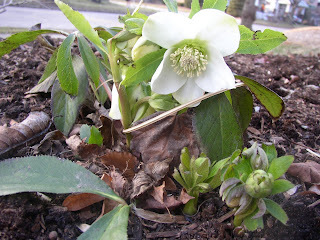 So here's an updated picture of the same old white hellebore that keeps making me smile, along with today's lists. In answer to Carol's Gardening Shoe Challenge, I am posting a picture of my favorite gardening shoes. Here they are--and the best part is, I got to wear them outside today! In March! Inspired by one of Mr. Brownthumb's amusing posts, I headed out into my yard this evening to pick up the trash that blew into my garden and was trapped there by the winter snows. It's too soon to really tidy the garden, as temperatures are falling back into the 20s this weekend. I might as well allow the clusters of fallen leaves and remains of last year's plants to insulate the sprouts at this point, since the snowcover is no longer around to provide protection. I did notice that one of my hellebores is beginning to bloom, and I'm doubly excited because I made a wonderful discovery when I leaned down to inspect the white flower at close range. I thought I had lost its neighboring hellebore over the summer, but I spied distinctive little green fingers reaching their dark, sawtoothed edges out of the ground! It must just be testing my patience. I know that many people like it, but I detest this retaining wall block in the same way that I detest all things plastic and particleboard. If I had the money for it, this would be a stacked stone wall--maybe giant chunks of sandstone, like those once used as edging by Rick over at Whispering Crane Institute. Alas, I didn't buy a winning MegaMillions ticket last week, so I'm stuck with the stacked block. But the spilling sedum is giving me some ideas for making it much more livable. The bed it "holds up" is definitely stable enough for me to remove the top two layers of stone temporarily this spring. 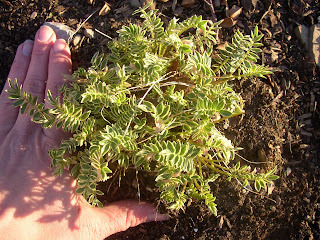 I will space the blocks much more irregularly, and plant some of my sedum sieboldii along with more of this 'Chubby Fingers' in the gaps between. In any garden, I like it when it appears that nature is taking over in spite of man's best efforts. 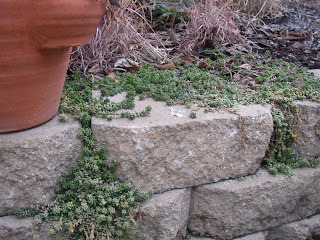 It's comforting somehow, and helping the plants invade the faux stone wall just seems like it's the right thing to do. Besides, there is plenty of cement in my tiny city garden already... and never too much green! Today was a gorgeous late winter day: Mid 40s, blue skies, sunshine. The snow that did not melt yesterday had disappeared by the time I got home from work today, save the large drift by my back fence. It is still a good 15 inches tall, mostly because that area is so dark in winter due to the severe angle of the sun. 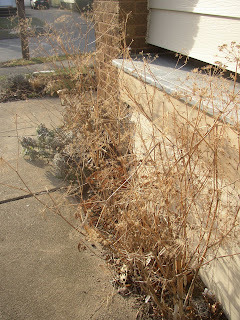 I grabbed my camera and went out to see what the thaw would reveal about my plants. Here was the bergenia, flat as a pancake on Friday when I first saw it but slowly recovering from the inner to the outer leaves. It's such a great color that even when it looks terrible like this, it still looks good to me. And the small sprouts of variegated Jacob's Ladder that had bravely emerged in early January are still there, looking none the worse for their snowy hibernation. Skeletons of bronze fennel are still amazingly upright by the side of the porch, and the silver leaves of sage are glowing beside the reddish leaf buds of 'Voodoo' sedum. The plant spotting that I was most excited about eluded me photographically... but all three of my purple clover (trifolium repens var. atropurpureum) are coming back! I think that they must have heard me grumble that I'd tried them for two years now and I wasn't going to replant them in 2007. Who says threats don't work on plants?! As far as checking gardening forums goes, I do it sporadically. I find that blogs are usually much more in-depth in the way that I crave. The other day, though, I had finished checking all of the blogs I like via Garden Voices, and decided to visit their forums. On the Perennials forum, a poster with the username "Aachenelf" (who I wish had a blog of his own, by the way) had posed an interesting question: "Have you gone through plant or gardening phases?" I'm a relative newbie in the world of gardening, so I was surprised to realize that I have already gone through quite a few phases. I'll post some more about my phases in a few days, but I wanted to pose the same question to all of you first. Any gardening phases that you've gone through? 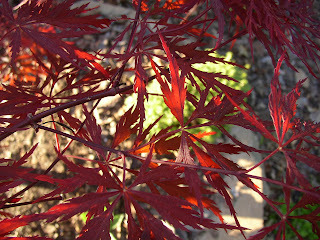 An expensive addiction to Japanese maples? A tireless quest for the perfect foxglove? The quest to create the perfect kitchen garden, worthy of a French chateau? The mistaken belief that you really needed to grow 37 different kinds of tomatoes--and that you would eat or can them all? Come on, now... this one will be fun. Let's all 'Fess Up!